This simple yet stylish finishing touch will brighten up boring envelopes and packages while making your life a little easier at the same time. The precise pattern of orange speckles is clean-cut, but it also gives anything you put in the mailbox a little bit of color and personality. While you'll love the way it makes your mail look, you'll be impressed with how much time you save on a typically tedious task. Forget about writing out your return address over and over again. Since your new labels are self-adhesive, peeling and placing them on every envelope is all it takes. 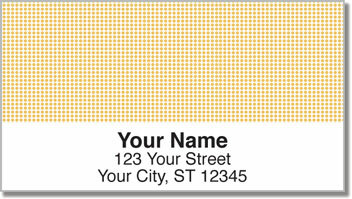 Get your own Peach Dot Address labels from CheckAdvantage today. We also offer other color options and matching check designs.